Most of the items on this page are available in North America by mail order from Rhythm Traders. Buda Records CDs are also available at their website. In 1967, Les Ballets Africains, the national dance company of Guinea, gave a performance of African music and dance in the General Assembly Hall of the UN Headquarters, on the anniversary of the UN’s adoption of the Human Rights Declaration. This 28 minute color film includes the performance and an introduction by H. E. M. Achkar Marof, Ambassador from Guinea to the UN. The film was narrated, and the introduction translated, by Alistair Cooke. Featuring an incredible performance by First Soloist Famoudou Konaté at age 27. Recorded "live" at festivals in Conakry, Guinea in 1990, this CD features outstanding solos and fine examples of the interplay between a master djembefola and virtuoso bass-drum accompanists, including the great dundunfola Daouda Kourouma. Comprehensive booklet in French and German includes cultural info, rhythmic concepts and notation. 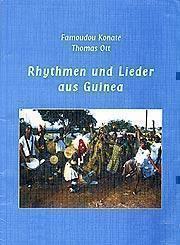 Designed for use in classrooms, Famoudou's book explains the musical principles behind Malinke drumming, while the CD's clearly-recorded examples demonstrate accompaniment and solo patterns. 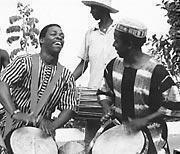 Famoudou’s sons, apprentices and extended family back him as musicians and singers. Recorded with Ensemble Hamana Dan Ba. 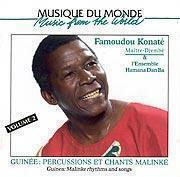 In contrast to the more instructional 1997 releases, this CD presents Famoudou's unique, "performance" arrangements of traditional Malinke rhythms, along with his extraordinary and dynamic solos. Featuring Famoudou’s nephew Nansedy Keïta as Second Soloist. Recorded at Famoudou’s home in Conakry-Simbaya, backed by his sons, apprentices and the great Diali (Jali or Griot) Singer Kadé Diawara on solo vocals. Famoudou demonstrates his versatility with solos on congas and bougarabous, several original compositions, and a piece based on the Dununba family of rhythms in which he solos on bells (“La Cloche de Hamana.”). 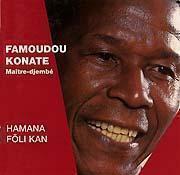 From the same sessions with Hamana Dan Ba as Volume 1, recorded in 1998, again featuring Famoudou’s nephew Nansedy Keïta as Second Soloist. Includes a definitive version of Dunumgbé, the mother of all Dununba rhythms, and a new composition: Bolokonondo II, extending the original Dununba rhythm. Famoudou makes a special appearance in this film documenting Mamady Keita’s return to Guinea. Famoudou is shown rehearsing with his young sons, other neighborhood children, and Mamady’s namesake, who in 2003 is a promising young djembe soloist in Conakry. 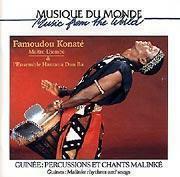 Famoudou solos on 5 tracks of this double CD, recorded "live" in Conakry in 1995. The title means "The Masters" in the Malinké language. Also features the great Dundunfola Daouda Kourouma. Includes a special performance of “Soko” featuring Djembe Masters Fadouba Oularé, Famoudou Konaté and Mamady Keïta. 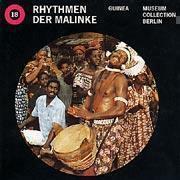 This CD presents the Dununba family of rhythms, the specialty of Hamana, Famoudou's home region in Guinea. His reputation as one of the greatest experts on the Dununbas accorded him Special Guest status on this CD, soloing on all but two of the 12 tracks. Also features the great Dundunfola Daouda Kourouma. Includes rare video footage of Djembe Masters Mamady Keïta (left), Famoudou Konaté (right) and Fadouba Oularé (not shown), performing together in Conakry, Guinea, during the recording of the Mögöbalu CD.